Today seemed to start out like a typical day working on the mill. Dad arrived a bit earlier than usual--7 a.m. instead of 8 and set to work on the picker. He seems obsessed with the picker. Today was the day to move the picker to its permanent spot and set it down off its skids. Which we did with very little fanfare and little difficulty and not too much arguing. After being set down, we had a visit from Jessie, my 16 year old komondor. Normally, Jessie spends 23 1/2 hours sleeping in the house--a side effect of the pain medication she is on for bone cancer (in her back leg). But, today, she came outside and ventured into the shed to pay us a visit. The other dogs have their favorite resting spots, too, when they are in the shed keeping us company. The dogs are all banished to either the house or the kennel before any of the machinery is started up. I would hate to card a dog! While Dad picked away at the picker, I picked away at some saffron colored wool/silk/nylon blend in hopes of someday carding it. Noon came and Dad decided it was time to go home and work on the mounts for the anti static bar for the carder (yippee!). He would return in the afternoon. While he was gone, I finished picking the wool, continued dyeing wool, washing wool and then unrolled the apron for the picker and applied some belt dressing to the leather. When I was finishing that up, Dad returned with the mounts for the anti static bar. He mounted the bar, connected it to the power source while I spliced together a belt for the doffer comb--the two final things that remained to be done before we could actually card wool. And, then we carded. And we attempted to feed the wool through the orifice to draft into roving. Ugh! I was highly unsuccessful. Not quite, as I tell my students, frequently. I was greatly disheartened. What if I can't make roving! Well, a break was in order. While I made brauts, Dad adjusted the doffer comb. After we ate, we tried again. Gosh we've been busy and August is flying by. I can't believe its been a year since I bought the mill. On August First, we flew to Wisconsin to visit Carol and Paul Wagner at Hidden Valley Woolen Mill. We toured their mill, watched Carol make a 15 pound quilt batt! Observed one of their carders in action. Picked their brains. Looked over the machinery. Saw their beautiful farm and sheep. And had a fabulous lunch. One thing we really wanted to see was their picker. Our picker is now in pieces and parts and missing some parts and we needed some ideas on how to get it back together and working. Unfortunately, the Wagner's have a completely different brand, make, model and type of picker from ours. But we did get a good look at it. We came back from Carol's and Paul's with full stomachs and lots of ideas and suggestions. Thanks to Paul and Carol for a great day and for being such kind and generous people. I highly recommend Hidden Valley Woolen Mill--they do beautiful work and I've had my fibers processed there for many, many years. The picker is picked apart. In July, Dad picked it apart and started painting it while I picked wool on the little picker (the working model). First the blower got the beauty treatment. Then its the picker's turn to be picked apart and given the beauty treatment. In between coats of paint, while I was diligently picking wool on the Meck picker, Dad would pick out the wool from between the slats on the picker apron. All in all, he spent about three days working on that. While he picked and painted and puttered about, I picked wool on the John Meck picker. All in all, I think I've picked about 150 pounds of wool and I now have picker's elbow in my right arm. I pieked so much, so long, and so hard, that I broke the bolt holding the handle on the picker Saturday morning. I had to make an emergency trip to the hardware store to buy bolts. On Saturday, August 3, we had our first official visitors in for a tour of the mill. Alice and Gordon Stone of Texas, formerly of Braham and Cambridge, MN, came for a visit. Gordon is my Grandmother's cousin (Dad's Mom). They attend Braham Pie Day every year and made a special stop at the farm to see the mill. It was a great pleasure to have them both here. We visited; showed them the mill; ran the carder; and greatly enjoyed them. Hope you both will come again next year! This past week, on August 14, we flew down to Austin, MN to visit with Tom Yates of Minnesota Valley Woolen Mill. Tom gave us a tour of his mill. We spent a lot of time with Tom talking about mills, gathering information, hints, and suggestions. We looked closely at his picker in action (again, very different from our picker). We were also able to see his carder in action. Tom has a newer carder that he was using. I believe it was built by Carolina Specialty. He also has an older, 1800, carder that he was working on. We saw Tom's retail shop full of fibers, knitted and woven goods and beautiful yarns. We also saw his wool scouring facilities in town and got a tour of the town. Tom was a great source of advice, hints and suggestions and I will definitely be asking his advice again. Minnesota Valley Woolen Mill also does a lovely job of processing fiber. I can highly recommend them. And, he has a pin drafter! I thought Faribault would be close enough to drive to, but no, we flew down there on August 15 to tour the woolen mill. It was a very interesting tour and I highly recommend it to anyone interested in the process of making wool into roving into yarn into woven goods. And dyeing, too. It was fascinating to me. Their woven blankets and scarves and finished goods are just beautiful. After the tour, we walked downtown and had lunch at the "Cheese Cave." Great cheeses from the Faribault caves. 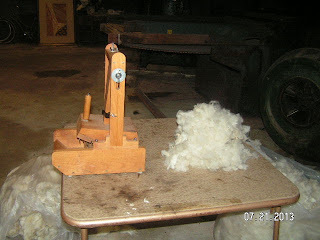 Then we flew home in time to work a bit on the mill (well, I picked wool and Dad did some work). Are We Ever Going To Card? We are so close to carding. We just need to mount an anti-static bar and power it up, make a belt to drive the doffer comb, put the chain on the drafter, power up and get going. I am hoping this week will be the week that we actually see some wool come off the carder.